Planning a new-look bathroom? The basin or perhaps pair of bathroom sinks you decide on will have a significant impact on the look of the room. But it’s not just aesthetics that count in a functional space. The basin may have to cope with multiple daily users if it’s in a family bathroom, and it needs to be comfortable and convenient to use, too. 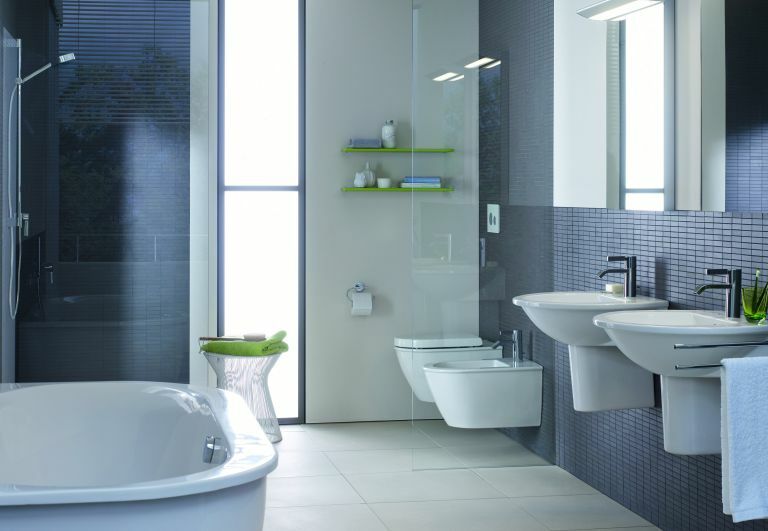 With a multitude of styles and a broad selection of materials, how do you choose a bathroom basin well? We have all you need to know. Pedestal basins have a stand on the floor that hides the pipework. They’re extremely popular as a design and can look contemporary or more traditional as you prefer. Semi-pedestal bathroom sinks are wall-hung, but still have a pedestal below. The pedestal’s shorter than that on a pedestal basin, however, and doesn’t reach the floor. The advantage is that plumbing is still concealed, but with fewer fittings set on the floor the room will look more spacious. Wall-mounted basins pull off the same space-expanding trick as semi-pedestal sinks because the floor below is on show. The possibility of positioning a wall-hung basin at the ideal height for either a tall adult or for kids to use is a strong reason to choose one. Go for a metallic bottle trap and the pipework below will look smart. Inset basins can be part of a vanity unit or washstand that creates useful space either side with which the top of the basin’s sides align. They might equally be set into the top of a bathroom storage unit or bathroom worktop. An inset design looks sleek, and extra countertop space alongside or drawers or a cupboard below will help the room stay clutter-free. Semi-recessed basins are designed to be positioned so the back section is set into a worksurface or bathroom furniture, while the front protrudes from the setting. Choose one if you like the idea of countertop space around the sink but don’t want to lose the curves or angles of the basin as a focal point. Countertop basins are designed to sit on top of bathroom furniture or worktops. They make an attractive feature and can be used to introduce a contrasting material or finish, or match bath and loo in white. They may be bowl shaped, oval, rectangular or square and there’s a huge choice on offer. Corner sinks are space-savers in small bathrooms. Do weigh up how small you want to go, though, as face-washing in a very small basin may prove awkward. Once again, a metal rather than plastic bottle trap will give the bathroom the best finish. As with other bathroom fittings, basins generally fall into traditional and contemporary categories. Traditional sinks have more elaborate detailing around the basin itself and on the pedestal, which this style classically features. However, for small bathrooms consider alternatively traditional-style basins on chrome or metal washstands and elegant single and double console basins with curvaceous legs. There’s a wider choice of contemporary bathroom sinks with either flowing or more angular outlines that will enable you to complement the lines of bath and toilet if you’re opting for individual fittings rather than a matching suite. What are bathroom sinks made from? Pick the material for your basin for its practical qualities as well as looks. Some are best suited to an adults-only en suite and others will stand up to the rigours of a family bathroom. Ceramic sinks are the standard option and are easy to clean with a high gloss finish that emphasises the cleanliness of the room. It’s an ideal material for a family bathroom. Resin sinks may be part of a vanity unit, making the wall-hung furniture less heavy. Resin is a low-cost choice. Solid surface sinks are hygienic and easy to clean. Solid surfaces can be used to create seam-free basin and countertop combinations. Stone sinks are often countertop designs. They’re a more luxurious and expensive option and are best for en suites rather than family bathrooms. You’ll need to follow the supplier’s instructions on sealing and care of the stone, too. Glass is also a favourite for countertop bathroom sinks. Like stone, it can make an impact as part of a palette of materials within the bathroom. Save it for bathrooms where the likelihood of anything being dropped on the basin is minimal. Wall-hung basins need to be secured to a solid wall – stud walls aren’t likely to be strong enough. Call in a builder if you need advice. Many sinks come with pre-drilled tap holes, which will determine whether you’re searching for a monobloc or single lever tap or a pair of pillar taps. Basins without tap holes need to be teamed with wall-mounted or tall washbowl taps, depending on the design. Don’t forget the waste. Plug and chain designs look traditional but many modern basins don’t have a hole for the chain. More frequently chosen nowadays are pop-up wastes with a lever or flip-top wastes.